Partners must work together towards a common goal. This means that everyone involved should agree on proposed outcomes and the means of achieving them. In a safe cities for women programme, all partners must agree on what safe cities and communities for women and girls are, and on why they are important. Moreover, all partners should agree on the priorities and challenges their community should focus on while achieving these goals. This way, everyone will be able to work together on a common solution rather than working against each other (Women in Cities, 2007, 12). For example, if members of the police department believe that safe cities programming should focus on increasing the number of police patrolling the streets, but health service partners believe that programming should focus on mental health services for survivors of sexual assault, these two partners will compete for resources instead of working together on their larger goal. Community Assessment Planning Tool (n.d.). This tool, produced by the Minnesota Department of Health, can be used by safe cities for women project partners to assess what kinds of gender-based violence and what kinds of audiences they want to address with their activities. Available in English. Remember to be patient and plan with a long-term vision. The issue of women’s safety is an emotional one that affects everyone’s lives. A safe cities for women programme requires a number of partners from different backgrounds. It takes time to build relationships, trust understanding within this context (Community Coordination for Women’s Safety Project, 2005, page 45). Therefore, in order for there to be enough time for partners to build meaningful relationships, it is important that the safe cities for women programme have a long-term vision that partners commit to. For more information on setting goals, objectives, and outcomes, see the Decide on a Conceptual Framework section of Programme Design. Case Study: ‘Partnership Continuum’ in A City Tailored to Women: The Role of Municipal Governments in Achieving Gender Equality (Michaud, A., 2004). Federation of Canadian Municipalities and Femmes et ville international, Canada: page 40. 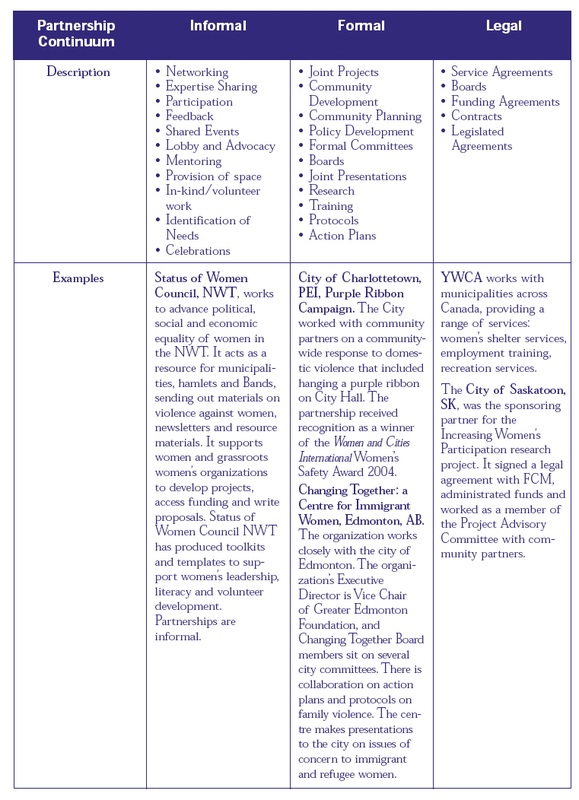 This tool provides descriptions of partnerships between women’s organizations and municipal governments, drawing from Canadian examples. These examples fall into three main partnership categories: informal, formal, and legal. Available in English, French and Spanish.